It has been a week since Stephen Paddock, a 64-year-old retired accountant and high-stakes video poker player, unloaded on 22,000 country music fans from his 32nd-floor suite in Las Vegas’ Mandalay Bay Resort moored on the city’s Sunset Strip, killing 58 people and wounding hundreds before fatally shooting himself in the head. On Monday, Clark County Sheriff Joseph Lombardo announced a change to the sequence of events that occurred on Oct. 1, saying a security guard who encountered Paddock was actually shot at 9:59 p.m. local time, minutes before the 64-year-old unleashed a hail of gunfire on unsuspecting concertgoers. Previously, authorities had said that the security guard, Jesus Campos, was shot after Paddock had opened fire on the crowd below. Lombardo said Campos immediately reported to hotel security that he had been shot. However, responding officers did not know Campos had been shot until they arrived on the 32nd floor and encountered him, Lombardo said. It’s unclear what ultimately led Paddock to stop shooting at the people below. Officials had originally thought that Campos distracted him. 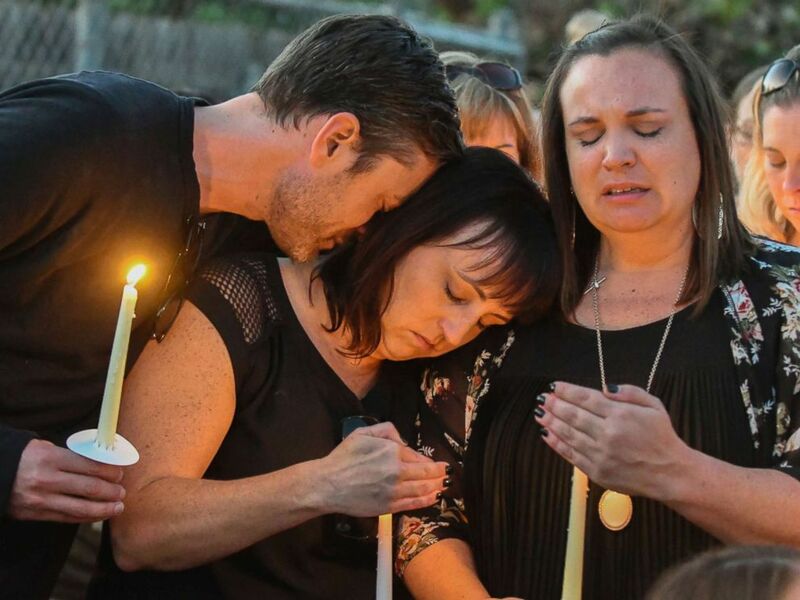 At least 200 mourners came out to the elementary school attended by the late Nicol Kimura in Placentia, California, where they lit candles and held photos this weekend depicting happier times for a woman whose smiles and cowboy boots radiated. She was one of the 58 people slain by Paddock’s bullets. Dozens also came out along the Huntington Pier in California to remember the lives lost. Some of the bereaved were at that Route 91 Harvest concert in Las Vegas when gunshots rang out. The signature Strip’s blinking lights went dark Sunday night in memory of the tragedy exactly one week after the mass shooting. After questioning Paddock’s girlfriend, Marilou Danley, federal agents returned to Paddock’s three-bedroom home resting on a cul-de-sac inside a sleepy retirement community in Mesquite, Nevada. They breached the boarded-up garage days after Las Vegas cops first searched the home shortly after the rampage and confirmed they pulled 19 guns and several pounds of potentially explosive materials. The return to the residence that Paddock purchased back in early 2015 was reportedly for “re-documenting and rechecking,” local police Chief Troy Tanner, who tagged along with the FBIagents to serve the search warrant. A note containing handwritten numbers for wind, trajectory and distance was discovered by Paddock’s body inside the Mandalay Bay room. 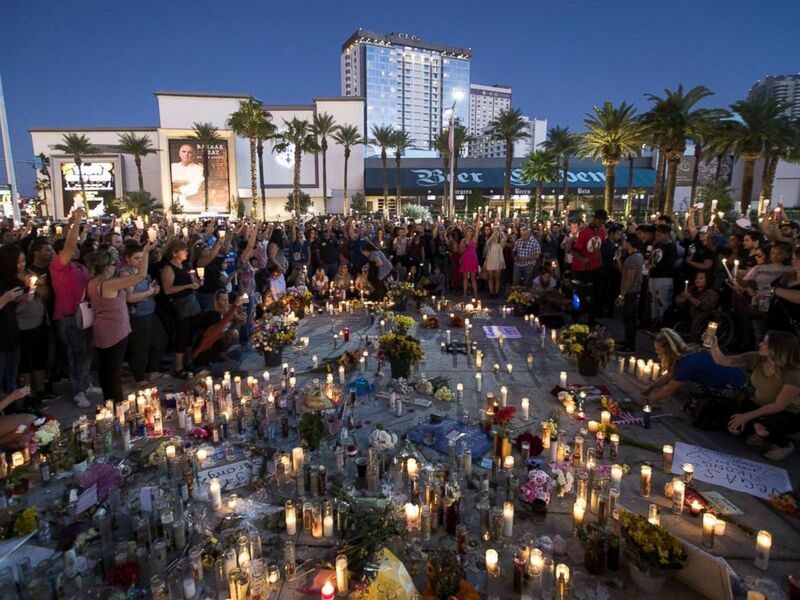 Law enforcement officials briefed on the investigation confirmed to ABC News Sunday that the note found on Paddock’s hexagon-shaped nightstand contained such numerical figures. Stephen Paddock’s younger brother, Eric Paddock, arrived in Las Vegas Sunday to aid authorities in their investigation. He added that his brother wasn’t one to harbor any strong political, extremist or religious beliefs. 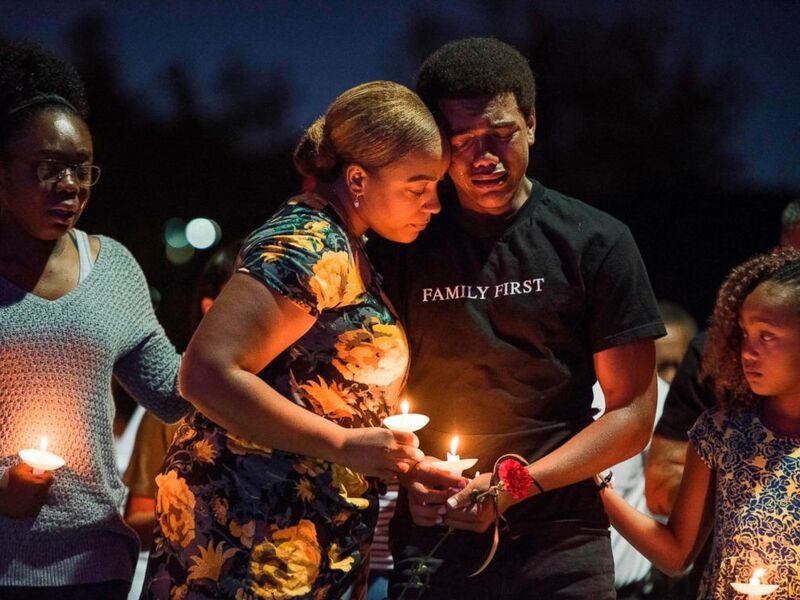 While ISIS came forward claiming responsibility for the attack shortly after the death toll rose, the FBI has not uncovered connections between the suspect and any foreign terrorist groups. Lisa Crawford spoke to “Good Morning America” Monday about working as Stephen Paddock’s property manager from 2006 to 2012 in Texas. She recalled him as generous to his tenants. When her boyfriend fired bullets at thousands of unarmed concertgoers, Danley was in the Philippines “to see family and friends,” she said in a statement. Stephen Paddock had apparently purchased her airfare to the Philippines and then wired her money to purchase a house for herself and her family. The move made her “grateful, but worried,” thinking that Stephen Paddock was breaking up with her, she said in her statement. She added that she had planned to be with him in the future. “I loved him and hoped for a quiet future together with him,” she said in the statement.